Márk Zoltán Kékesi: "It's almost consensual that nobody is welcome in Hungary"
Márk Zoltán Kékesi is a sociologist and member of MigSzol organisation in Hungary. 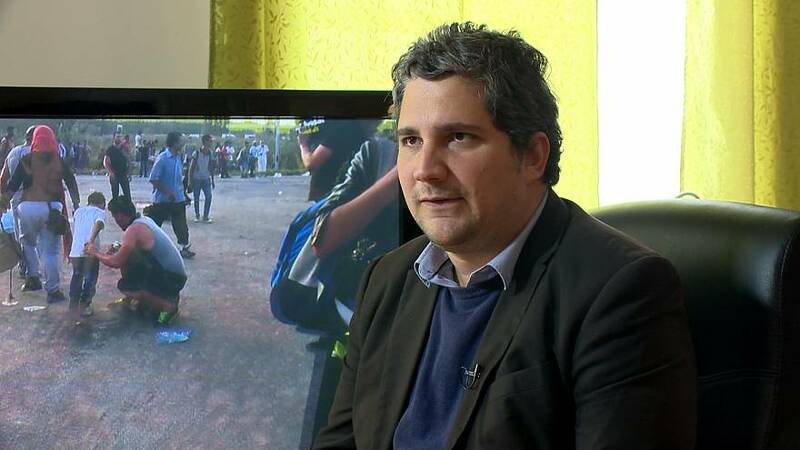 In an interview with Euronews reporter Valérie Gauriat, he describes the situation at the border with Serbia, and analyses the Hungarian nationalist sentiment, nurtured by Viktor Orban’s narratives. “The situation is that the border is closed, of course you cannot completely see the border. But people will get through somehow. People will go around. People will bribe themselves in. People will climb over or dig under the fence, people are determined to go. Of course it’s possible to slow down the influx of people with this fence. But we know about a lot of people, and currently there are 3 ways to get into Hungary. One is to wait to get into the legal way in the Hungarian transit zones, and the outcome is not certain. It might be a negative decision of the political asylum claim. And waiting lists are very long and blurry. Priority is not transparent on these lists. And that also calls for a lot of attention I think. The other way is to cut the fence or climb through somehow and try to sneak into Hungary. This way you are risking to be severely beaten brutally, robbed and treated very badly by the police in Hungary. Hungarian police unfortunately gained a reputation of being one of the most violent and anti-human police force in this part of the world, along with Bulgarian and Croatian police. It is pretty obvious that there is frequently reappearing of absolutely unjustified brutality on behalf of police in Hungary against illegal entrants. And the third way that we don’t see at all is to pay smugglers, and using the traditional techniques of double vault trucks and so on, which is always risky. But we don’t know about the numbers. Valérie Gauriat: What are the numbers? “For the transit zones, it’s absolutely not transparent. Nobody can go there. not even the propaganda television of the Hungarian government is not allowed to go in. So there is no monitoring. UNHCR is there but they also complain about the non transparent nature of the asylum process in the transit zones. The numbers I think in 2017 so far to my knowledge it is around 600 people who were granted subsidiary protection or refugee status by the Hungarian government. And also to my knowledge after getting the status they are most likely to go further to western Europe. And the push-backs, those people who were caught entering illegally, the number of push-backs is somewhere between zero and 50. Each day it’s changing. Valerie Gauriat: You’ve been to the border quite a few times. What is the sentiment there? Is there a real “anti-migrant” sentiment amongst the population? Valérie Gauriat: How do you explain that Viktor Orban’s rhetoric is working so well amongst the population? Is there something specific about the Hungarian nationalism or national sentiment? “Hungarian nationalism has certain characteristics that is making it a bit odd, even in central Europe. We all know that in this part of the world, national identity and mother tongue go hand in hand. If you are a separate nation you have to have your own mother tongue. In central Europe especially in the Carpathian basin, there are far more Hungarian speakers than the number of people in Hungary. Because of the first world war and the treaty of Trianon after WW1, a large part of culturally and ethnically Hungarian people found themselves outside of Hungary. Mostly in Romania, Slovakia and what is called Serbia now. This is causing a sort of a cultural nationalism that is strongly in tie with the language. National identity, especially in Hungary is based on language, the native tongue, mother tongue. A Hungarian is a person whose mother tongue is Hungarian. Living wherever in this universe. And also the odd nature of the Hungarian language that it’s practically unrelated to any other language spoken in central Europe, creates a sort of sentiment among many Hungarians, that leads to the feeling of being isolated. We don’t see that sort of brotherhood in case of Hungary and Hungarians, as many other Slavic nations see or feel. That we are isolated here. And also the historical rhetoric that’s part of the history curriculum in Hungary, and has been part of the curriculum ever since history is taught in schools in Hungary, is kind of a passive narrative: we’re not shaping our own lives. We’re always under the oppression, under the attack of big empires, like the ottoman empire, the Habsburg empire, Moscow and the Soviet Union. So Hungary throughout history had very little chance to shape it’s own culture. And this is largely believed throughout Hungary.